When I’m not in the garden or orchard, I’m in the kitchen. Here are some of my favorite recipes, some fancy, some not, but ALL delicious, so says me. Enjoy. I just stumbled on your site.I’m sooo glad I did cuz I’ve learned so much! My husband and I will retire in 3 months and are looking for info to raise our own garden foods;can use all the help we can get on how and when and what to plant then can and freeze in zone 7.We will have a celler to work with as well. Myra, welcome and thanks for the kind words, I hope I can help you get your hands dirty and dinner plates happy. Raising your own food is challenging at times, but counter with being a lot of fun and oh so delicious and rewarding. My daughter Jessica sent me a link to your site. I am loving looking and reading your wonderful comments. Last night Jessica invited my husband and I over for dinner. 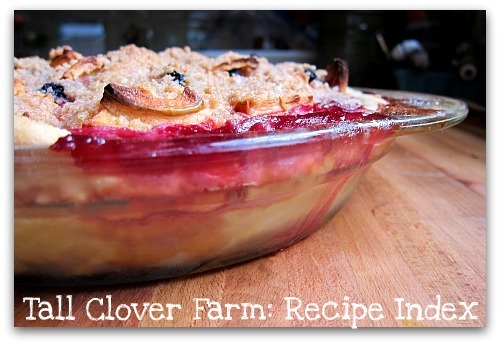 When we got to the dessert, she proudly served us your Apple, Berry Custard Crumb Pie! It blew everyone away!!! It is by FAR the BEST EVER pie I have had the pleasure of eating! I love custard, and the crumb topping was amazing. I usually do not like apple pie, I think it is boring because it is just too many apples. Your pie was the best of both worlds! Jessica’s husband could not stop eating it, and my husband had a HUGE piece and went back for more!!! Many thanks for the receipt. I am going to try some others you have on you blog. Please sign me us for your postings. I can’t wait. Elyse, your comment made my day. I love it when friends and family enjoy time and food together, oh yes and rave about pie! Now Elyse, just wait until peach season, this pie rocks my world when I substitute apples and blackberries for peaches and raspberries. UM UM good! Thanks for your kind words and contagious enthusiasm. Drat! I just went to your recipe index hoping to find a peach pie recipe – no such luck; which surprises me. Do you have a favorite you might be willing to share? Karen, that is so funny, I just can’t decide which one to post, maybe I need a whole section of Peach Pie Recipes. Okay I’ll post at least one soon. Came across your site while looking to find out how to tell when figs are ripe. We bought a home in November and it came with a fig tree – I’ve no idea what kind. I’ve never cared for fresh figs, and usually only eat them as Fig Newton cookies. But, since we now have a fig tree I figured I might as well try to do something with them. So thanks for your tip on how to tell when they are ripe. And I may just have to try your bacon/cheese/fig wrap. That’ll be TWO new things to try – fresh figs and goat cheese!! Tom, out of curiosity, have you ever made tomato jam? I was hoping to find it in your list of recipes but no such luck. I have had it on top of either cornbread or grit cakes and was thinking it would be a great condiment to add to my appetizer arsenal. Would love to get your take on it. Thanks! Hi Betsy, you know I do make tomato jam, I like it a lot–especially on cornbread and grits like you mentioned. I’ll find my recipe and post it. Thanks for thinking of such a great thing to share. I still can’t believe it took me so long to move to the country! This is so great, Tom! Hi Lincoln, hey I’ll drop you an email the next time I’m in Yakima, no doubt I will be hoarding peaches! I’m on the look out for another recipe – ever heard of rose petal jam? I bought a jar at a very overpriced kitchen supply store that I can not help but frequent. I think it might make an interesting ingredient for buttercream icing or a filling / glaze for a wedding cake. Any idea how you might make it? need help! Making peach jam for the first time and its not thickening up.. the peaches are kind of breaking down, lots of juice, and tastes good. but not nearly as thick as they say its suppose to be. HELP! did i use to much sugar??? I did 1 cup of sugar for every cups of peaches…ugh. Oh and i followed the recipe with NO pectin. =) Thanks!! Hi Melinda, Here’s what you can do, fine grate a peeled apple into it and the natural pectin of the apple will thicken it up, and the apple will dissolve into the peach mixture and not even be noticed. Good Luck! Do you ever make apple pie filling for canning? I have so many apples and I’m tired of apple sauce and apple butter! Any other ideas for preserving? This just looks so good, I can’t stand it! I’ll have to make it soon. I came across your site, Tom, while looking up info for the Sweet Meat Pumpkin I found at the farmers market, and I’m so glad I found it! Your beautiful life out on the island looks like paradise to this New York City dweller! Actually, even just the hammock looks like paradise at the moment. Thanks for sharing your passion! Hi Lawrence, your kind words are a fine sweetener for this morning’s coffee. Thank you, very much. I visited your site and dang, I have to applaud your enthusiasm, humor and skill in the kitchen, not to mention the song in your heart. Great to meet you and I look forward to future conversations. Hi Tom, Same here! Thanks, so much. I’m primarily a musician (composer/singer), but do this as a side business. It’s fun and keeps me out of trouble. The dream is to make a living solely as a composer, so I can live in the country and divide my time between writing, gardening and cooking. Thank you for providing me with lots of inspiration! btw…the Sweet Meat Pumpkin was so delicious just roasted with nothing on it, I had to stop myself from eating it before pureeing it for other things. I may have to go and buy a couple more!